Here's another missive I wrote and saved when we were sans internet..
Today was a long day of mostly travel, started out with a quick breakfast at the girls’ apartment, said my teary goodbyes (no matter how old they are, it never gets easier!) and then headed down the road. The drive from Gainesville to Savannah took longer than anticipated, about 5 hours total. 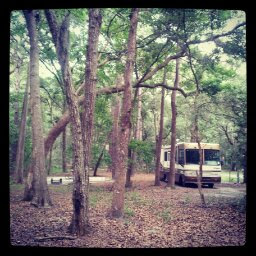 The destination was well with it, though, as the Skidaway Island State Park is gorgeous! So many trees for shade, so many trails for Loki and I to explore. We set up camp, took Loki for a short stroll and had a glass of wine on our “patio” before dinner. I had already researched the nearby restaurants and decided that after our long tiresome drive, a simple casual meal was in order; pub fare, perhaps! Molly Macpherson’s Scottish Pub was just the place. The pub was very warm & welcoming and the kilt-clad waitresses added to the charm. We started out with a Scottish brew while we decided on food. 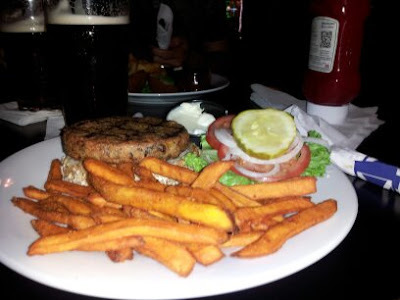 I had already browsed the menu online so I knew that there were several salads, a veggie burger and a vegetable wrap available; I chose the veggie burger and sweet potato fries. Chip enjoyed the Scottish sampler which consisted of onion rings, a Scotch egg and a meat pie. Groan. I have intentionally not included a picture of that lovely fried mess! My french fries were damage enough for one day! We were both too exhausted to do much exploring but we did stop for one more beer at The Rail Pub. Neither of us were particularly impressed with the atmosphere or the service so we headed back to the camp. I’m looking forward to tomorrow, plan to visit the Davenport House and have lunch at the #1 rated restaurant in Savannah, which just happens to be vegan-friendly! But for now, I hear the Sandman calling my name.